These impressive, stately mushrooms were growing in needle duff under Norway spruce in a public park in central Illinois, in 2005. 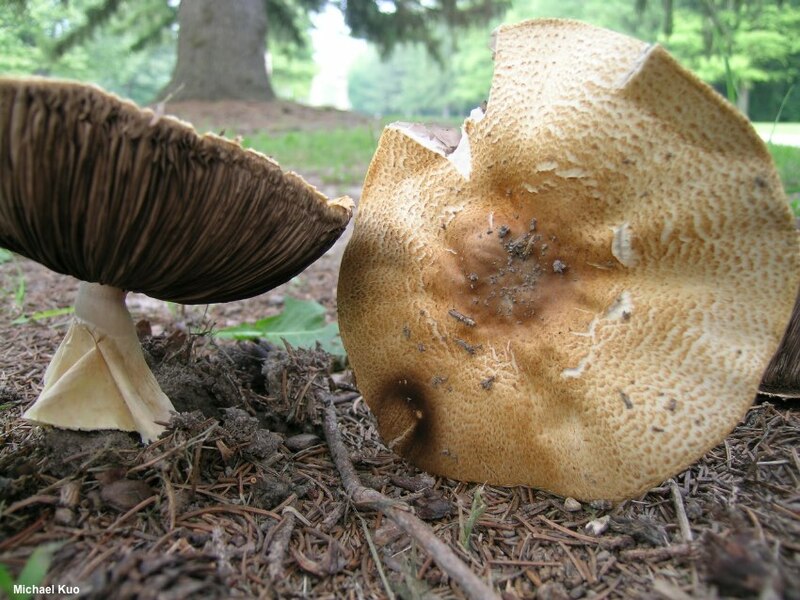 Their gills, which were free from the stem and brown at maturity, placed them in the genus Agaricus—and the large size, strong almond odor, and scaly orangish brown cap put them somewhere in the vicinity of Agaricus augustus or Agaricus subrufescens. 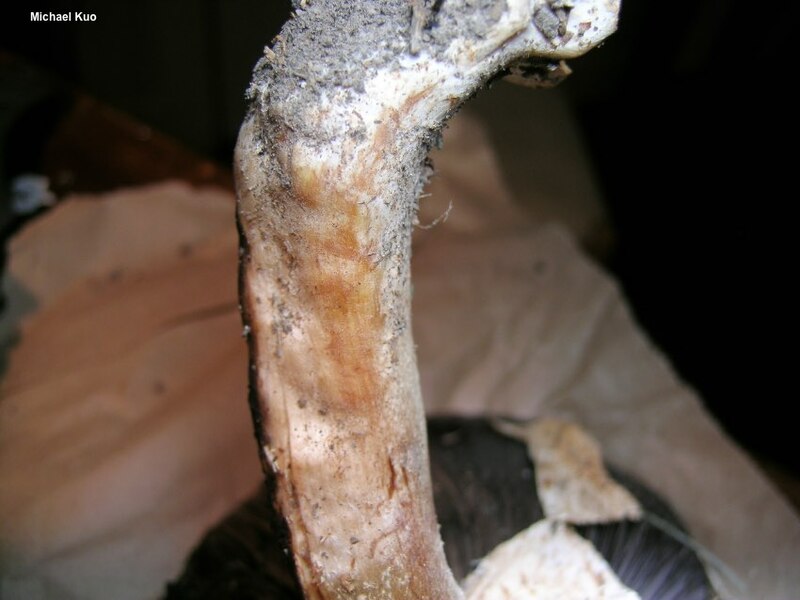 The former, however, is a West Coast species with larger spores, while the latter has a more reddish brown cap, a smooth stem, and is usually found in compost heaps. 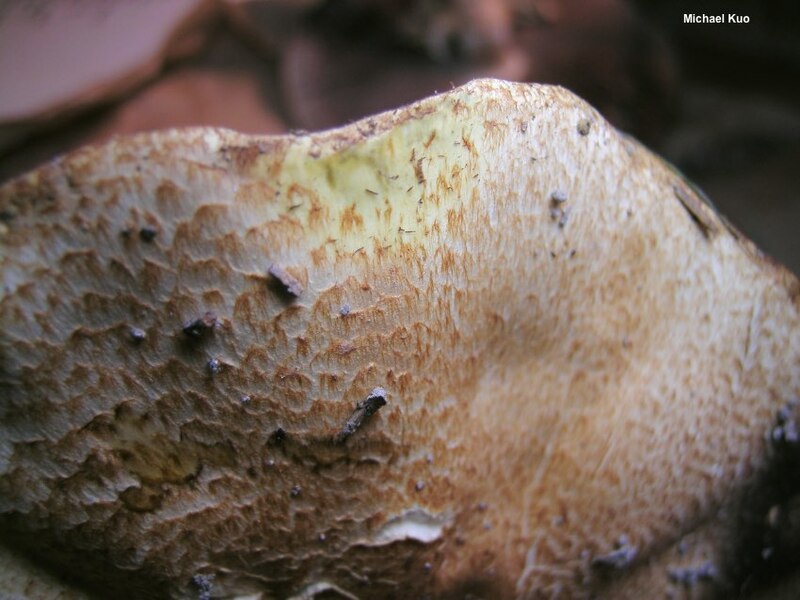 In 2016 Agaricus expert Richard Kerrigan described Agaricus nanaugustus, partly based on the collection featured here, as a new species, closely related to Agaricus augustus but differing in its smaller size, orangish brown colors, smaller scales, and smaller spores. 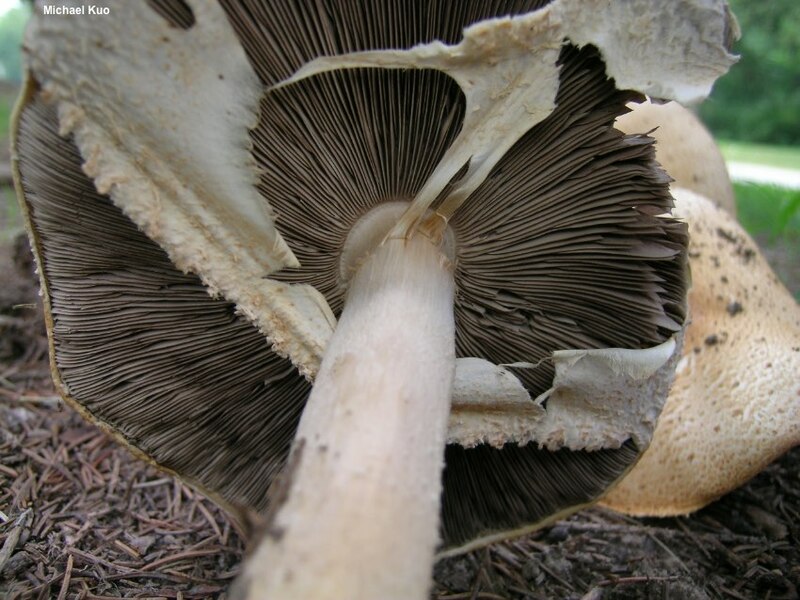 Kerrigan cites collections from Pennsylvania, Illinois, West Virginia, and Arizona, and speculates the species may be present in Michigan, based on Kauffman's 1918 treatment of "Agaricus subrufescens" in that state. Ecology: Saprobic; growing gregariously under Norway spruce, blue spruce, and other trees, including oaks; summer and fall; known from Illinois to Pennsylvania; possibly distributed throughout eastern North America. The illustrated and described collection is from Illinois. Cap: 5–19 cm; convex at first, becoming broadly convex or nearly flat; dry; radially fibrillose when young but soon becoming scaly with orangish brown to golden brown, fibrillose scales over a pale golden surface; the margin not lined, yellowing when rubbed repeatedly. 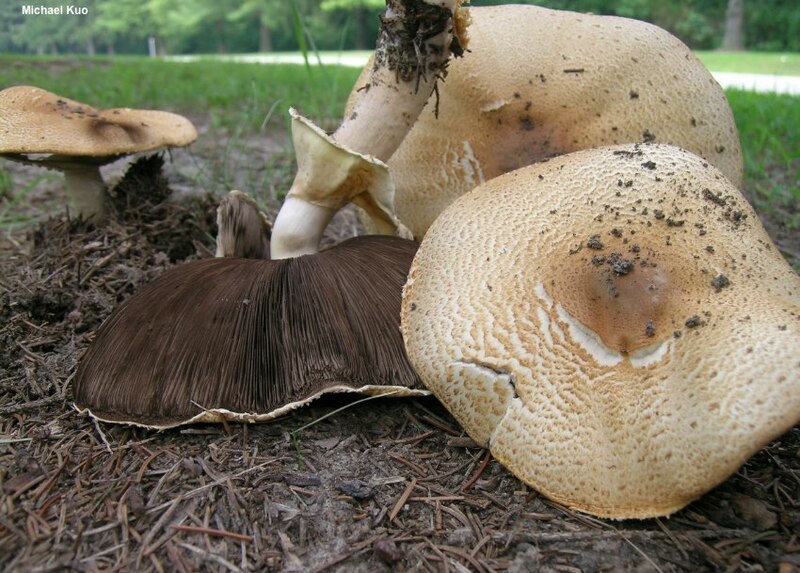 Gills: Free from the stem; close or crowded; short-gills frequent; pinkish when young, becoming dark brown with maturity; covered with a whitish partial veil when in the button stage. 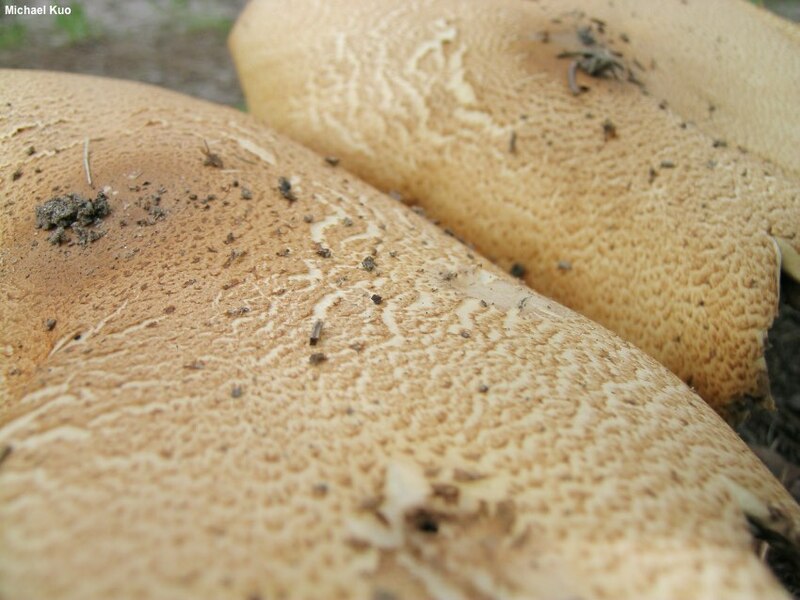 Stem: 5–10 cm long; 1–2.5 cm thick; equal above a slightly swollen base; fibrillose to somewhat shaggy; with a thick, rubbery, white to yellowish ring; whitish; bruising slightly reddish brown; basal mycelium white. Flesh: White; firm; unchanging when sliced, or becoming yellowish to orangish. Odor and Taste: Strong; reminiscent of almonds. Dried Specimens: Cap and stem dull orangish. 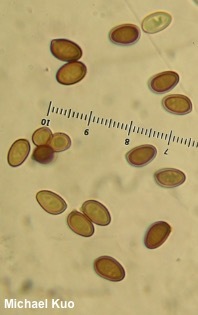 Microscopic Features: Spores: 6–8 x 4–5 µm; ellipsoid; smooth; thick-walled; brown in KOH; brown in Melzer's. Basidia 4-sterigmate. Cheilocystidia 10–25 x 6–10 µm; mutliseptate and catenulate; terminal elements subglobose to clavate; smooth; thin-walled; orange-brown to hyaline in KOH; soon collapsing. Pleurocystidia not found. 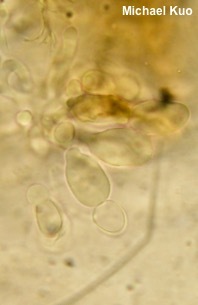 Pileipellis a cutis; elements 5–7.5 µm wide, smooth, golden yellow or hyaline in KOH. REFERENCES: Kerrigan, 2016. Herb. Kuo 08250605.